Sullivan’s cabin is a 1940’s, 2 bedroom with single beds. It has a living room with a couch, two lazy-boy type chairs, a fireplace with insert and propane heating. For cooking it has a nice kitchen with modern appliances, and a dining area with a table for two. Note that it is off the grid, and is powered by solar electricity (with a propane backup system). The water pump has it’s own smaller solar panel. Artists that need a lot of natural light should know that he cabin is a little on the dark side, naturally, due to being surrounded by woods. That said, there were plenty of lights (they all had LED bulbs). I brought some of my own lighting (with LEDs) so I could direct the light to my table. Being concerned with running out of power, I was conservative with my energy usage, as I didn’t want to test out the propane backup system (however, I brought lots of backup lights/lamps). During the 3 weeks I was at the cabin, there were very few cloud covered days. Space was not an issue with one person. Sullivan’s cabin was larger than I thought and I was able to move things around for my studio. My art tables were set up in the living area due to the larger windows. The lighting was somewhat better in bedroom 2, but the living area had much more space. I work on several paintings at once so the larger space won. It’s ok to move things around as long as it’s put back to it’s original setting. Being that it is in a remote location, there is no cell phone coverage (as of October 2017). I was a bit worried about this, but it ended up being very good. There was nothing digital to distract me! The Park provided a walkie talkie radio for any emergencies. You can also drive about 10 minutes towards Grand Marais to receive cell phone reception (around the Logslide). But for real, it was great to be disconnected and to focus on art (it was like I was transported to 1993-ish before the www – ha!!). Both restaurants in Grand Marais had wifi connection, so it was nice to visit every so often and post updates to my blog, family and friends. The cabin is perched next to Sullivan’s Creek. A short, hidden path (with Wintergreen!) joins the North Country Trail, leads you to a bridge, where you can check out some nice views of the creek and small cascades. Since Lake Superior is literally across the street from the cabin, I made almost daily visits to the shore around sunrise and sunset. Also along the shore you will find Wild Blueberry. It was unseasonably warm so I was surprised to see a few Blueberries here and there. Learn more about applying to the Artist in Residence program at Pictured Rocks National Lakeshore. I’d be happy to answer any questions you might have if you are applying or accepted to the residency. Read more about my experience on my blog. See more art from the residence. As I mentioned earlier, during my Artist in Residence at Pictured Rocks National Lakeshore, I keep my head down when walking. One of my favorite things to do is to look at all the different rocks and pebbles along Lake Superior. Down state, it’s not as colorful, so I’m just amazed by the variety, color, and textures of the rocks at pretty much any beach on Lake Superior. 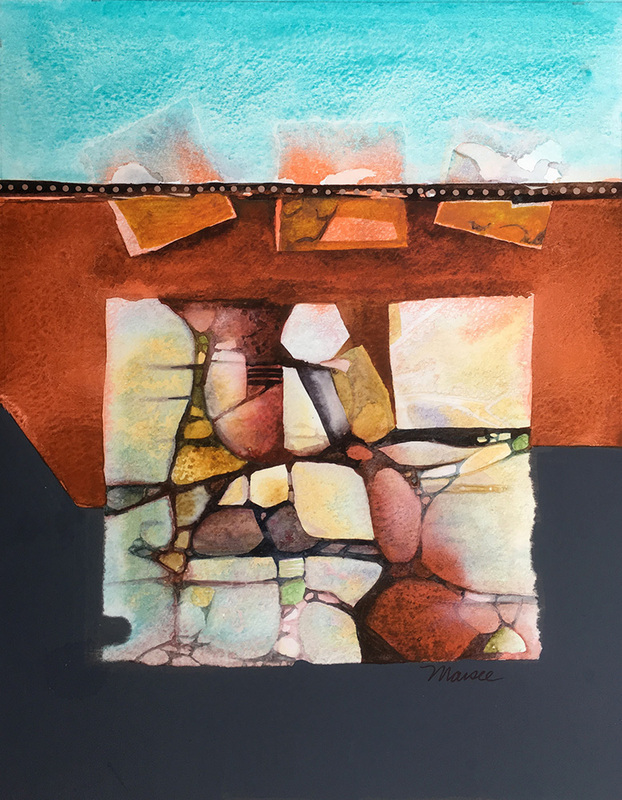 “Lake Superior Rocks” a watercolor painting donated to the Pictured Rocks National Lakeshore Artist in Residence Program art collection (2017). Oh, and this is tough. It being a National Park (and other beaches in general), we are to take only pictures and leave only footprints, and not take the rocks so others can enjoy them. It’s pretty much like an angler’s catch and release! A few years back, on Lake Michigan, my son Ryan collected a bunch of rocks (um, many of them 1/2 the size of my head) and wanted to take them home. I explained to him that it was a state park and that we are to leave no trace and lets leave them for another person to discover them. He was very upset and cried for the next 20 minutes of driving, which made me think I should have let them keep the mini boulders. I kinda felt the same way with my rock collection. I wanted to keep them. I know there are sooooo many out there, but know that catch and release is the best policy. I took only pictures (which you can see above). So, my plate of rocks has ended up back at the beach where I found them. They served their purpose in color study and will forever inspire my art!